Nephews, nieces and cousins under 13 years of age who want to be your facebook friend! The above image is courtesy of Matt McKeon. 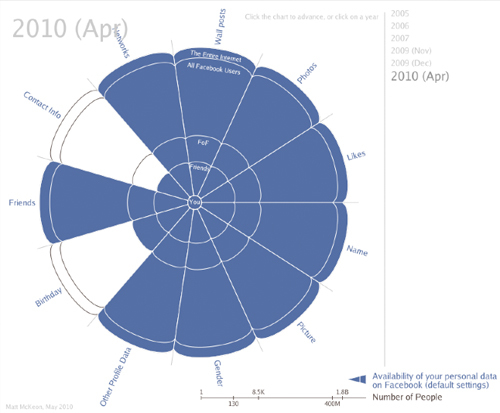 If you visit the blog you can see Matt’s cool visual interactive interpretation of the evolution of privacy on facebook (2005 to 2010). THE PROBLEM – Private or public information? This is a hot topic at the moment. It reaches a vast array of common social and business issues. And it also carries a heavy undercurrent of personal and universal themes. The content on my facebook page is populated by hundreds of facebook friends which means I cannot monitor everything that is posted (unless I sit there and monitor it 24/7). What do you do when a 13-year-old nephew sends a facebook friend request? It can be anyone you classify as under-age in your selective world (a relative under 13, a colleague’s child) whom sends you a facebook friend request. There are good reasons be exclusive and say no – or ignore the friend request. And there are as many reasons to be inclusive and say yes – accept the friend request. The problem is both options do not offer a satisfying solution. Have a think about it for a second. Imagine saying no and then imagine how you would deal with it down the line. Then imagine saying yes and dealing with it down the line. At the crux of this issue are several things for example: internet censorship and taking responsibility for the content, taking responsibility for the audience and taking responsibility for the messages in your personal digital space. I confronted this problem a few years ago and decided to say yes to the friend request from my 13 year old nephew. And then very quickly interrogated my facebook privacy settings and figured out how to select who can and can’t access areas of my facebook profile. Once the new settings were activated I tested it out. First, I advised my nephew’s mother that I had accepted her son’s friend request and granted very limited access to the content on my facebook page. She was relieved and thanked me profusely. From there it has been much easier to understand where my digital borders start and end. It has also been possible to move them as and when needed. From this point I decided to play and tweak every facebook privacy – on, off, up, down. I followed this up with testing the result with different friends and associates. Before this happened I had an ignorant viewpoint on internet censorship, and now I firmly believe parents are responsible for what their kids do on computers in their own home. And uncles and aunts (or adult relatives) also share this responsibility to a degree. This article is not about internet censorship, or family values, nor is it an instruction booklet on how you should raise your kids. And I am not going to engage in any conversation about these things online. This article is about giving consideration toward facebook as a the common denominator amongst the majority of people online. And acknowledging facebook has opened its ‘walled garden’ and made almost everything that was once private, public. Whether this is good or bad is not the issue. What you can do about it is the point. Take control of your digital space. Analogically imagine your photo album and personal items available on your front lawn for everyone to see. Conceptually, fifteen minutes of fame will soon be ‘fifteen minutes of privacy’. You don’t have to take notice of this if you don’t want, however most people will need to learn how to manage their own personal digital space. You will need to start thinking about how to manage your unprotected data, how to lock and unlock things online. And you will need to figure out where are your digital borders and how much does it cost to manage your bytes. Courtesy of IDC (via Sean Kelly) you can take a look into the future of the digital universe. 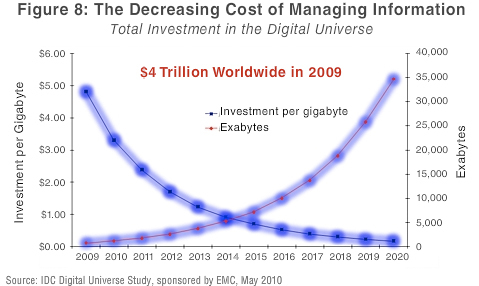 “..In 2009 the world spent nearly $4 trillion on stuff to manage our digital universe. 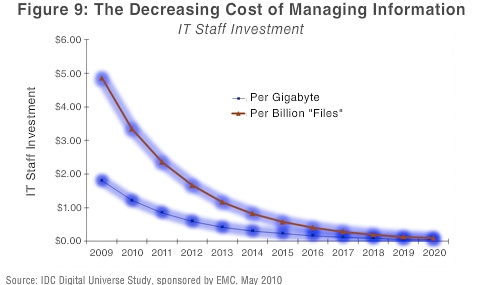 As this spending grows from now to 2020, the cost of managing each byte will drop steadily too, which is an incentive to create more information…”. Here are a couple of graphs to help visualise all this stuff – Figure 8 and 9. Manage this stress better than competitors and you will have the advantage. So much debate about MySpace at the moment. . . This is a CALL OUT for your thoughts on “Online Worlds”. Tell us what do you think? My inane curiosity needs you to contribute toward this – which is also an AdSchool assignment. Get it off your chest and help by sharing (if possible please fwd this survey to any teenagers). Once it is finished I will share a presentation of results here on my slide share. Incidentally, we have also completed extensive qualitative research [in-depth interviews] and therefore if you are interested in more infomation on this subject then let me know via email here and I will look into it for you. ‘Snow Crash’ is a virtual landscape that draws on the aesthetics of early flight simulators and low-fi computer graphics. It embraces a finite world of reduced planes akin to sci-fi concepts of the ‘metaverse’ in Neal Stephenson’s ‘Snow Crash’ or the ‘Autoverse’ in Greg Egan’s ‘Permutation City’. The world we live in is becoming more networked through technology with the likes of Google Earth, online games and social networks (to name a few). However this world [created by Harriet Birks] exists in a beautiful emptiness that is outside the mainstream networks. This space can also be described as the relics of civilisation situated it in the distant future. Not a tricky concept to wrap your head around, however if you can get your head around the last sentence then you should be experiencing a paradox. And if you are lucky to have a sense of humour then you may also be swimming in a parody. If you get both then you should call your mum and tell her you’re going on a date with me. The audio track crackles with static interference suggesting possible radio transmissions from unseen origins. Pulsing black spheres and clusters of quartz crystals float eerily in the sky. In a simultaneous glance back at the past and its post-apocalyptic narratives of the future, it provokes questions about our current direction and our changing technological landscape. Harriet Birks is an Audio Visual artist and a lecturer of animation at COFA, UNSW. If you are back from vacation, in between jobs, or hammering away at the responsibility of four roles at once, then you probably need validation to turn off your mobile, email and social media tools from time-to-time. “Seeing the big picture, the connections between information, is also more likely to activate the right hemisphere, which appears important for insight. If you have no time to read this article then here is a ten second summary: 1) A rested mind isn’t stuck in the wrong answers. 2) A quiet mind notices subtle signals. 3) A happy mind is an open mind. Source-train: My Facebook Home/Find Your Yang/99Percent/”Your Brain at Work” by David Rock. First post. Bit nervous. To cure nerves I will start with a quote to set the tone and theme. “There is no greater mood enhancer than conversation with another person. It’s a holiday from yourself, richer and more dynamic than hearing a good song, reading a funny story, or blasting monsters to pixel smithereens on your computer” – Catherine Blyth, author of The Art Of Conversation. Funny to imagine it, however sometimes I notice people either ask a bunch of questions in a row (forgetting to make statements) or make a bunch of statements in a row (forgetting to ask questions), or keep talking till breath runs out. This is not conversation. It is as dynamic as a pull-string-doll. I am probably one of these people at times. Real dialogue between two or more people is more intriguing than one-way outward expressions from one person. Into context using tennis as an example: What is more interesting? a) Watching someone serve a ball without a receiver, or b) A skilful rally between two adept players. I assume most people choose the latter. Online examples of short rallies between two or more players can be found in forums, blog comments, facebook wall posts, or an email thread between two people. However you don’t really see examples of skilful dialogue between two people in the online world – if you do then it is in script format (which is not easy to digest). Generally if you want to experience this you watch a movie, listen to a radio show with 2+ hosts, or hang out with two good friends and listen to their conversation. Or obviously have a conversation in the flesh or on the phone. I notice more connections between people are ending or breaking more often and the connections between people are looser than ever – especially in younger generations. I notice more disjointed levels of expectations between people and preconceptions that mislead one person to believe the connection with a significant other is something that it is not. These are common themes when breaking up or ending a connection, however I think the ‘end’ or ‘break’ can be polarised, exacerbated or expedited when social media tools are involved. Is there an antidote? Do we need one? We trust recommendations and word of mouth more than anything else, including people we don’t know [strangers]. As pointed out a few weeks ago by Jonathan Carson, President of Online, International, for Nielsen Research – “The explosion in Consumer Generated Media over the last couple of years means consumers’ reliance on word of mouth in the decision-making process, either from people they know or online consumers they don’t, has increased”. Not ground-breaking news for most technologists and online freaks, however it is helpful to get the facts direct from a reputable researcher – who I respect. It is an arduous task to set up and produce this kind of solid information. The point is, this makes me curious to probe and understand what is happening to people’s behaviour and conversations in the flesh (as a direct affect of this change in online activity). Below you can see Ji Lee’s 10 Levels of Intimacy in Today’s Communication. It is both an interesting and absurd display of the redefinition and possible redistribution of how we continue on with our most cherished connections. On the subject of social media, word of mouth and real life conversations, I thought of Cuba where there is no advertising other than political propaganda. One of the last places with a high-density of living with no consumer based advertising. The Internet is not available to everyone that lives there and therefore in order to find stuff, the most locals need to speak to each other to work out what, where, when, how, why etc, for almost everything. The result is a culture based on listening and speaking in the flesh. The craft of conversation is alive and well in this part of the world. No wonder everyone’s dancing in Cuba. Do you notice less engagement in real life conversation? Do you notice connections breaking more often? Are looser connections better? On social media: Does it change the way we converse? Does it teach us quality or quantity? Does it make you unappreciative of real life bonds? Have your real life conversations changed as a result of it? Do you want to book a chin wagging session time in a conversation box? Do you need to go to Cuba?